For the first time in my career, my choreography was performed in two major theatres at the same time! I had the pleasure of working on ELF: The Musical at the Chemainus Theatre Festival, and A Christmas Carol at The Belfry Theatre. Five years ago I did some choreographic consulting for A Countryside Christmas in Chemainus, but other than that I hadn't yet had the opportunity to work at CTF. I was thrilled, and nervous when Mark DuMez (the AD) phoned me two weeks before rehearsals began with the news that his original choreographer had fallen ill and he needed a replacement. I went to work learning ELF, which turned out to be a massive show! I choreographed ten major dance numbers in two weeks and set off for Chemainus. We had two weeks of rehearsal to put it all together, and I must say that this is one silly show. We were in hysterics almost daily with the sheer ridiculousness of it all. Lucky for us, the show was 90% sold out before we even opened. Due to my existing contract with The Belfry, I had to duck out tech to head back to Victoria for A Christmas Carol. Thus began the longest week of my career. I was rehearsing all day in Victoria, then driving 1.5hrs on the sketchy/dark/wet Malahat to Chemainus to watch a preview. I would take notes, distribute the notes to the cast, and then drive home to begin it all again. I was happy to be doing both shows, but the driving was intense! 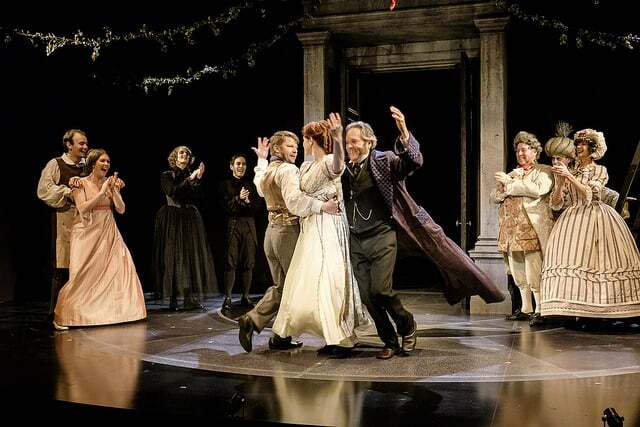 A Christmas Carol was a re-mount that I also choreographed and performed in three years ago. It was a joy and blessing to be involved once again in this beautiful show that was adapted and directed by Michael Shamata. This was the 25th year that this adaptation was being performed, and almost all of the original cast returned to perform in it once again. I don't perform much anymore, but it felt really nice to be onstage for once in this production. I got the chance to dance my own choreography, and spend time with such lovely artists. All in all it was a great holiday season!